It’s no surprise that when the first American settlers reached this isolated canyon in southwest Utah, the name that came to mind was Zion. This “dwelling place of God” is filled with an unworldly beauty created by mountains, canyons, buttes, rivers, and arches that make it one of the most unique natural settings in the country. The 229-mile square park is known for its red-colored Navajo Sandstone and dozens of spectacular canyons to explore, but the park is actually quite diverse. Ranging in elevation from about 3,600 feet to more than 8,700 feet, you’ll find everything from coniferous forests to desert landscapes. 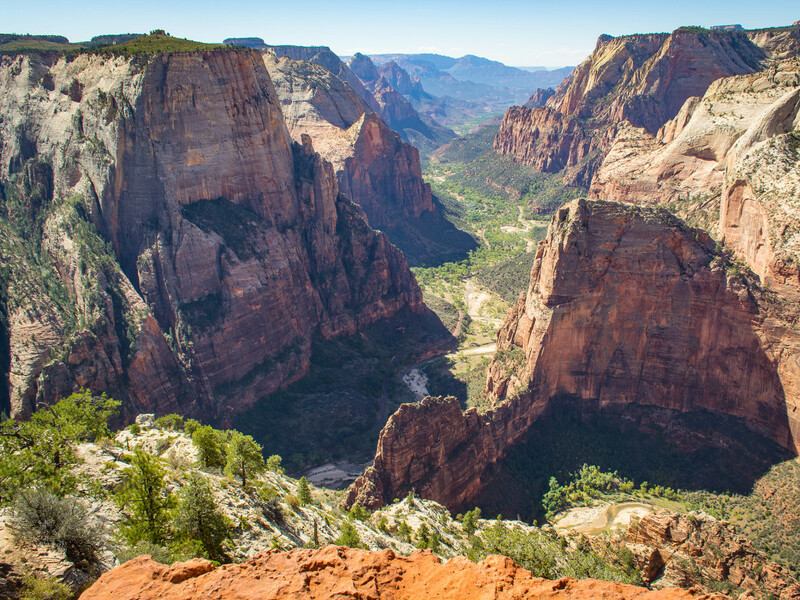 But it’s the impressive beauty of area’s canyons, especially the 15-mile long Zion Canyon carved by the Virgin River, that have attracted people to this corner of Utah for more than 100 years. While the history of humans in the area dates back 8,000 years, by the year 1300 A.D. any permanent developments had disappeared. Researchers speculate that extended droughts made agriculture—always difficult in the area—impossible. Nomadic peoples occupied Zion seasonally over the next 400 years, hunting and collecting wild plants. In the 18th century, European trappers moved into the region, and in 1847 Brigham Young led the Mormons to the Utah Territory. That group expanded from the Salt Lake City area to grow cotton in the southern part of the state in the 1860s, and the first log cabin was built in Zion Canyon, near the present location of the Zion Lodge, in 1863. But the combination of flooding and little arable land made settlement difficult and several of the small towns and homesteads in the area were eventually abandoned. It wasn’t until the 20th century that thoughts turned to attracting tourists to the area. In 1909, the Mukuntuweap National Monument was created by the executive order of President William Howard Taft, using the name that the Southern Paiute tribe used for the region. There was only one problem—the area was basically impossible for tourists to get to. The closest rail station was 100 miles away and the limited roads in the area were poor. Utah eventually improved the road system and the Union Pacific developed routes in southern Utah. It was 1917 when the first tourists reached Wylie Camp, a tent camping resort set up in Zion Canyon. 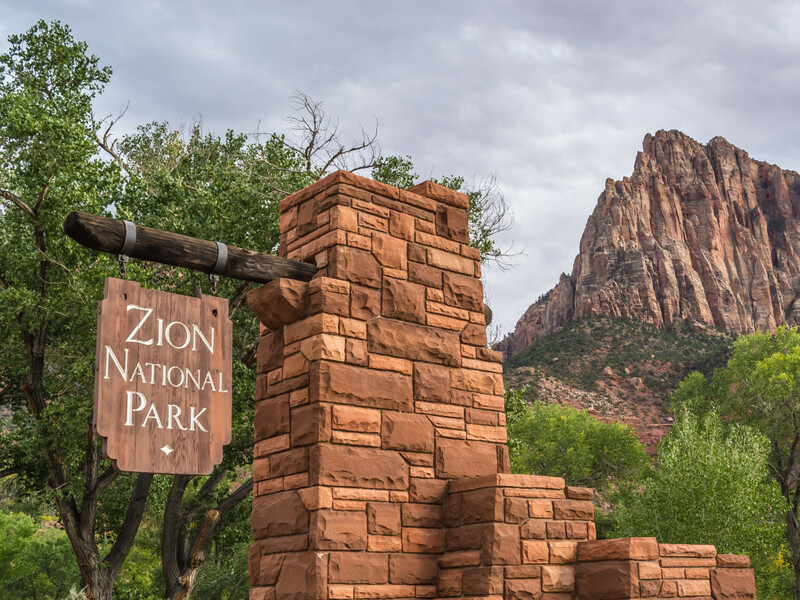 In 1919, Congress created Zion National Park, changing the name to something easier for prospective tourists to pronounce. 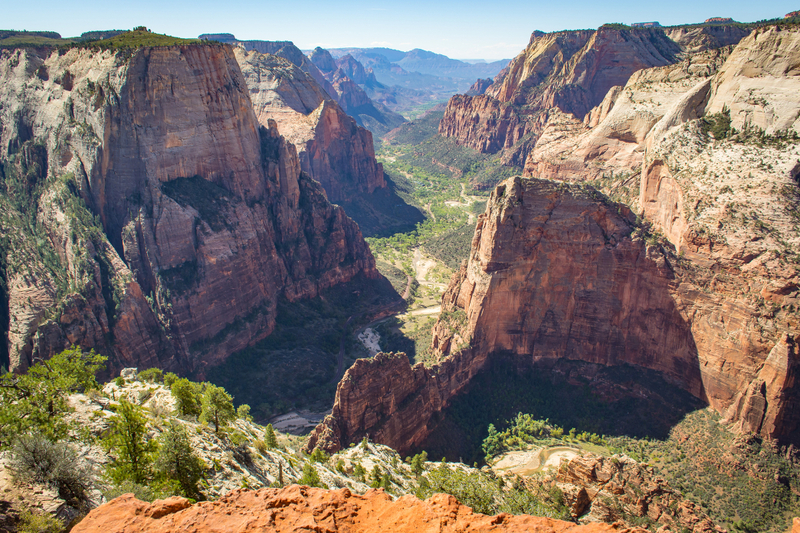 Zion National Park offers an incredible array of outdoor options for visitors, but it’s also one of the easiest National Parks to navigate. During the busier season from early spring to late fall, a free shuttle service takes patrons both to the entrance of the park from the nearby town of Springdale and throughout the park, giving you access to every trail without worrying about a car or parking. 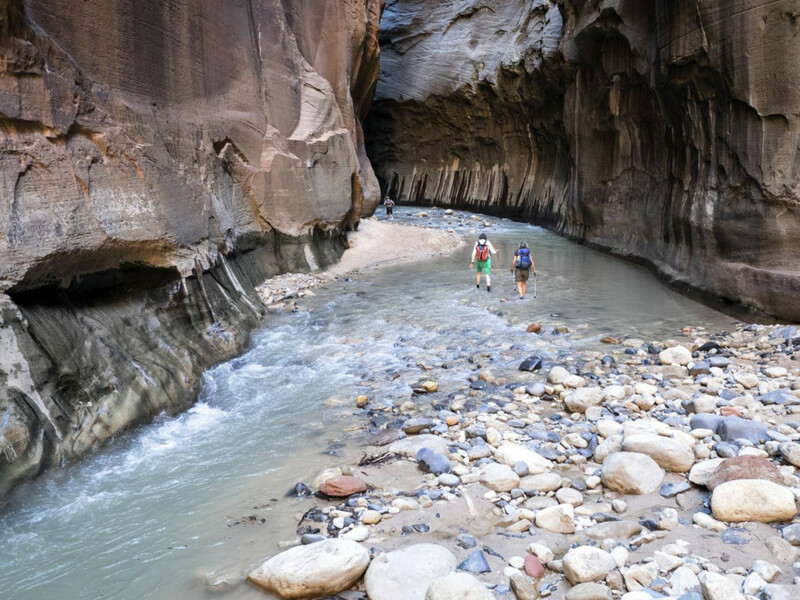 Zion is known as perhaps the best place in the country for canyoneering, a way to exploring the area that combines hiking, rappelling, problem solving, scrambling, and even swimming. You can choose from dozens of different canyons to explore—but be aware that the canyons that require more technical climbing skills require a permit. A great introduction to canyoneering can be found inThe Narrows, which is the tightest section of Zion Canyon and in places is only 20 to 30 feet wide and 2,000 feet high. The hike offers incredible views of one of the world’s most impressive gorges—much of which is done while wading upstream through the Virgin River on uneven river boulders. The hike begins a mile from the shuttle stop, and you return via the same route. For those with more experience,The Subway, which is on the left fork of North Creek, requires extensive route-finding—but you are well-rewarded for the effort. Permits are required for this one. You can choose to explore the canyon from the bottom up, which requires a 9-mile hike with extensive scrambling and creek crossings, or from the top down, which demands strong rappelling skills (and 60 feet of rope) plus swimming through several pools of cold, deep water. Zion is filled with signature hikes that feature impressive canyon views, but the most famous isAngel’s Landing, perched in the middle of the canyon and standing 1,488 feet above the river. This one, however, is not for the faint of heart. The steep trail cut into the redrock cliffs rises from the valley to the peak in just a few miles, requiring extensive climbing. More importantly, the final climb up a rocky spine along the ridgeline—aided by chains bolted onto the rocks—is as nerve-racking as it gets. The 2,000 foot sandstone cliffs of Zion are big draw for experienced rock climbers. However, because of their difficulty, they are not recommended for people without extensive climbing experience. Zion doesn’t have much in the way of sport climbing or top-roping options. However, you will find two accessiblebouldering areas in the canyon. One house-sized boulder 40 yards west of the south entrance offers a variety of problems for climbers, while the Drilled Pocket Boulder a half mile north. Mountain biking isn’t available in the park, butroad cycling has become popular as cyclists take advantage of the carless roads. Just be aware that cyclists must stop to allow shuttle buses to pass, and they may not pass through the Zion-Mt.Carmel Tunnel. About 40 miles northwest of Zion Canyon, but still contained in the park, are the Kolob Canyons , which offer another stunning area to explore that many people don’t get a chance to visit. Here you’ll find parallel box canyons that are cut into the Colorado Plateau, with impressive 2,000-foot peaks and sheer cliff walls. The five-mile Kolob Canyons Road offers a scenic drive for a quick look, but you’ll be thankful if you take the time to explore the canyons on foot. For a quick trip, the Timber Creek Overlook Trail is an easy mile hike that follows a small ridge overlooking the Kolob Canyons, the Kolob Terrace, and the Pine Valley Mountains. During the spring and early summer, the area is covered by desert wildflowers. For more adventurous hikers, take a trip to the Kolob Arch via the La Verkin Creek Trail, which is a 14-mile round trip. Here you’ll have much more solitude while exploring the Zion wilderness. Kolob Arch, which spans 287 feet, is one of the world’s largest natural arches. To stay inside the park overnight, the Zion Lodge offers 76 hotel rooms, six suites and 40 cabins available for rent. If you’re more interested in sleeping under the stars, you have your choice of three campgrounds. Both the South and Watchman campgrounds are located in Zion Canyon near the south entrance. From March through November, the campgrounds are full nearly every night. Reservations are available in advance for Watchman. Day-of spots are available, but they tend to be taken by noon on weekdays and the mornings on weekends. TheLava Point Campground is located at 7,890 feet in altitude, and is located about 45 minutes north of the town of Virgin. It features six primitive campsites that are available on a first-come/first serve basis. The town of Springdale, Utah, sits just outside the south entrance to the park, and offers plenty of options when it comes to lodging and dining. The free shuttle takes you right to the park entrance from town, making a stay here easy. Summer in the park can be uncomfortably hot, with temperatures reaching over 100 degrees during the day. Evening temperatures do cool into the sixties, but camping can still be difficult. Thunderstorms are common in the afternoon from July to September. The spring weather is cooler, with some wet days mixed in with sunny weather. Wildflowers bloom from April to June, making it one of the most popular times to visit the park. The cooler fall temperatures, along with the autumn colors, peaking in late October, draw many visitors as well. Winter brings the fewest crowds, but winter storms (including snow at high elevations) can cause some parts of the park to close. 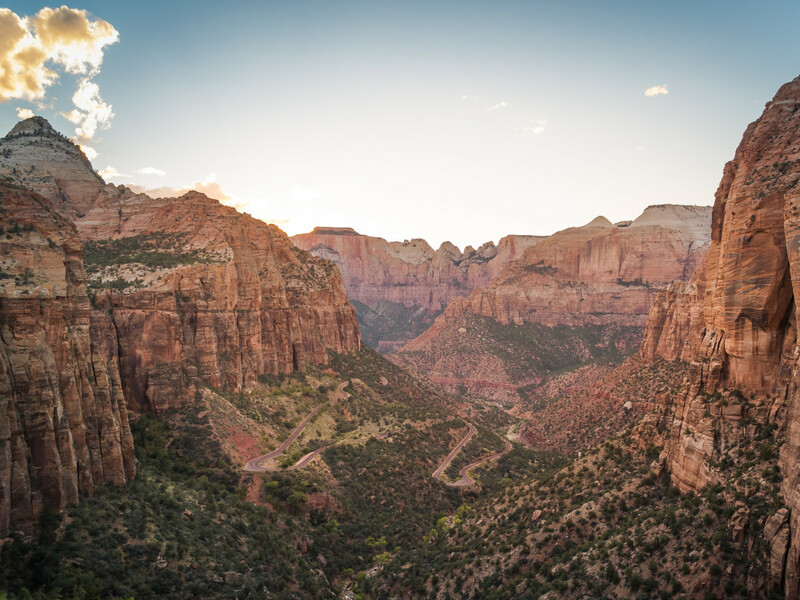 In general, Zion is known for a wide variety of weather conditions with temperatures changing significantly during the day and at different elevations. Be prepared for a variety of conditions throughout the day. Flash floods can be extremely dangerous in the canyons. Make sure to check with rangers for current conditions and be aware of upcoming thunderstorms. All technical canyoneering requires a permit. Half of the permits are given out through an advanced reservation system, which are secured three months in advance. Demand for The Subway and Mystery Canyon has led to a lottery system for permits. Remaining permits are granted 2 to 7 days earlier than your trip via a last-minute drawing, with any remaining permits available on the first-come, first-serve basis. The desert environment in Zion requires that you drink plenty of water. Expect to drink a gallon per person per day. Make sure you carry enough with you on the trail. It is also available at visitor centers, campgrounds, the Zion Lodge, and some shuttle stops. The 1.1-mile long Zion-Mount Carmel Tunnel was the longest tunnel of its type when completed in 1930, and it provides more direct access to Bryce Canyon and Grand Canyon National Parks. But the size of the tunnel has caused problems for large vehicles, so they now are only permitted to pass during certain hours of the day. For those driving an RV or other oversized vehicle, see here for restrictions. Bicycles are never permitted in the tunnel.